Bill Gates: “Millions Will Die” Because Of Global Warming ROTFL!!!! Billionaire Microsoft founder Bill Gates has warned that millions of humans face extinction due to the threat of man-made global warming. Appearing on Fox News Sunday, Gates slammed President Trump for attempting to reduce the U.S.’s $30 billion foreign aid budget, and warned that Africa will therefore be disproportionately adversely affected by climate change. “Fortunately the Congress took that proposal [to cut the USAID budget], which would have meant cutting people off from those HIV medicines, and they decided to maintain the foreign aid levels,” Gates told host Chris Wallace. He explained that in Africa in the past, for example, failed harvests occur about once every 12 years. With climate change, Gates predicted the failed harvest rate will be closer to one in four. Wallace asked Gates about the growing backlash in Washington against big tech. “Yes, the government should be talking to these companies about what they do,” said Gates, addressing the merits of Washington’s contention that big tech is exhibiting political bias and is doing too little to protect user privacy. “I’m sure these guys are learning better than I did, that they need to come back here and start a dialogue, and there will be new types of regulation for these companies,” he added. Privacy regulation, said Gates, “makes a lot of sense. Gates waxed philosophical on Microsoft’s edging out Apple as the most highly valued company in the world in terms of market capitalization. Microsoft took the lead at $800 billion, with Apple nipping at its heels with $799.5 billion. 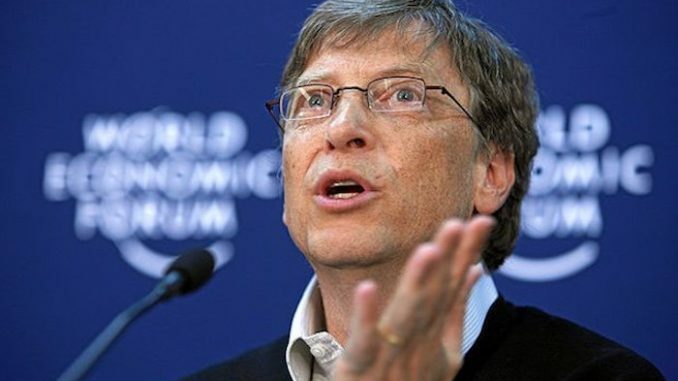 “It’s really better to define yourself by an aspiration,” said Gates, specifically noting the use of software to improve education and to contain the soaring costs of medical care in the United States. Bottom up means someday someone might have a better idea than him but top down means he gets to tell people what ideas they are allowed to have. Gates was extremely successful in information technology. Doesn’t make him a scientist or pro athlete or opera singer. Get people who know the subject.